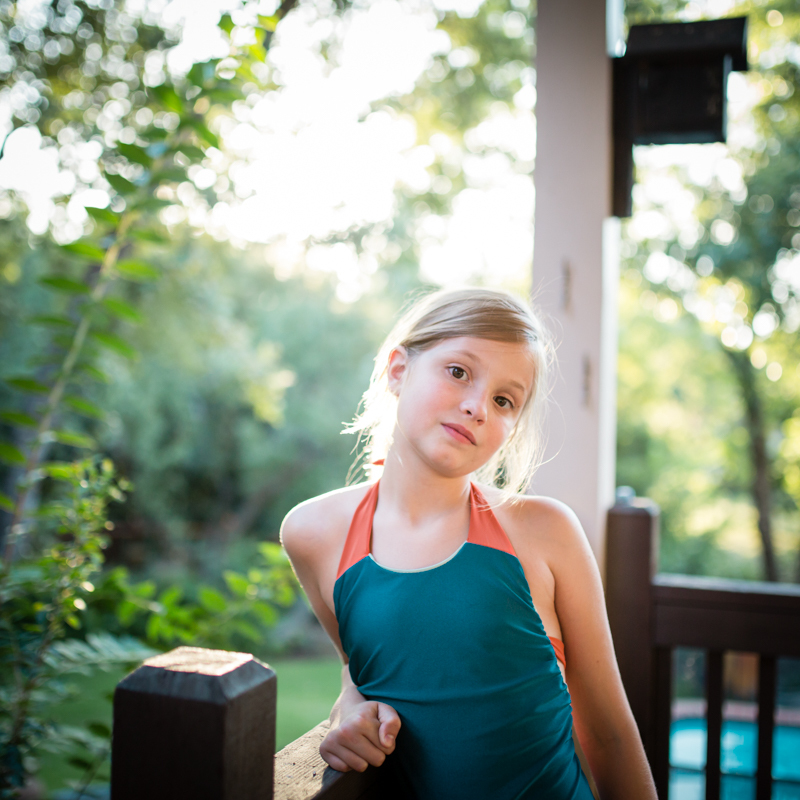 A couple of years ago, I discovered I could sew swimsuits for my girls. I was empowered, if not captivated. I made five Cosi swimsuits in a row, two of which were for Indigo. She wore those swimsuits frequently and the fabric held up amazingly well. It didn't fade nearly as much as the store-bought swimsuits we've owned. My double needle stitching held up admittedly less well and popped in several places. (I can't seem to make the double needle work with my machine, but that's another story!) Even still, the swimsuits were perfectly wearable and worn they were! Indigo finally outgrew them, as kids do, so it was time for a new one. 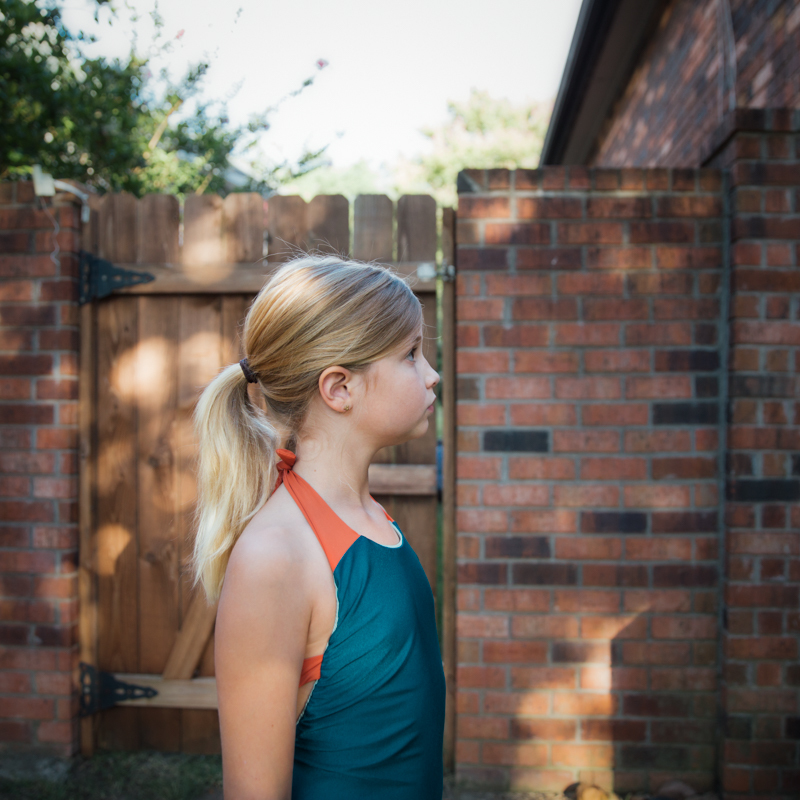 This time I chose the Azur Reversible Swimsuit pattern by Celina and Laura. Indigo didn't want anything that was too immodest, but she also didn't want anything too 'babyish'. (The horrors!) ;) Like the Cosi swimsuit, this was the perfect choice. Then I used this persimmon color as an accent for the straps and back panel. I love the look of both the back strap and the contrasting color-blocked back panel. I'm a sucker for those kind of details. They make this swuimsuit even more unique. Best of all, Indigo loves this swimsuit, too. In fact she wanted to hurry up and get our photos over with so she could wear it out to the pool as soon possible! And so, we did! Great suit! I like the detail of the mid-back strap as well as those wider straps at the top. I have used the Cosi pattern to make swimsuits the last two years and I love the fit, but I find the straps a bit unsubstantial; I might modify them to be wider next year. Widening the cosi straps is a great idea! Very nice! I always LOVE your color combinations, and this one is so good! I also have trouble with double needle sewing on my machine. Some day I will buy an overstitch machine...someday. These colors are awesome!! Did you even need a double needle for this one? I love your faux piping too! Gorgeous colors! The colors are very sophisticated, while the cut is very practical and modest. I don't say this often about girls' clothes - I would absolutely wear that myself! It's grown up in the sense of understated, without being grown up like tons of skin. Perfect! I must say I'm a bit envious of Indigo's perfect tan, though. My skin is pale - like, not pale white, but more like, pale blue - and I don't tan at all, sigh! That last picture!!! So good! Oh, this looks sooooo good! The colors are a fantastic combination and it totally doesn't look babyish : perfect! I especially like the peek of color at the neckline and the fit. :) I have double needle issues too and apparently had sewing swimsuit fabric issues today too. Luckily my fabric is sparkly and therefore forgiving. I love the modesty of the classic maillot. Such a great color combination, Rachel! Love it! 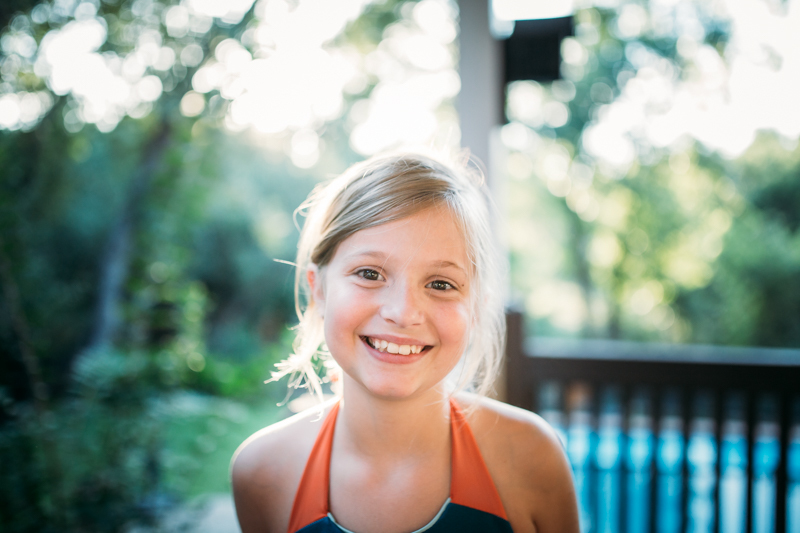 I've been also sewing a lot of Cosi swimsuits for my girls (love them all!) but now I am planning to sew an Azur for Teresa as, like Indigo, she is asking for a more grownup kind of swimsuit. Yes, I think we are having the same kind of "horrors" on opposite sides of the Atlantic... Why do these kids grow so fast?! About the double needle, do you use a regular or a jersey (ball point) needle? My machine used to skip many stitches when I used a ball point needle. I've tried the regular double needle and it almost doesn't happen now. Have a great swim at the pool! Hello Marta! It's true. They really do grow so fast! Who would expect that a ball point needle would result in more skipped stitches? You would almost expect the opposite to be true, wouldn't you? The great thing is that the Azur swimsuit does not require a double needle. So so pretty! I just adore the colour combination and style. It must be so satisfying to be able to sew swimsuits for your girls. Have you ever tried woolly nylon in the bobbin with a twin needle? I've barely had any luck with them until I tried that, although mind you that's only been one t-shirt worth of success so far! I have tried stretch thread but not wooly nylon. Stretch thread has eventually broken. Do you think wooly nylon is better? That's been my experience, too, sadly! :( Mine always pop! My first machine had issues with double needle. My current machine seems to love it! I consider myself lucky :) Love this swimsuit. The unintentional piping is a pretty neat detail :) I agree that the colours go so well together! I remember feeling like some sort of a super sewing person when I finished my first swimsuit. I expected sewing swimmers to be more complicated than it turned out to be. I really love that colour combination. Beautiful result! I have been having this same problem with the double needle. nothing I do will make it stretch enough!!!! but Ajaire told me about wooly nylon thread AND someone suggested a wider double needle, so I'm trying it!